The EMI-P30A and EMI-P50A are 30 amps and 50 amps low pass Power Line Filters respectively. Low pass filters are used in many different applications. In radio frequency applications, low pass filters are usually designed using inductors and capacitors. These filters are used to filter out unwanted signals that may be present in a band above the wanted pass band. 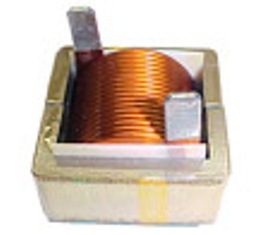 The EMI-Pxx series from Coil Winding Specialist (CWS) are designed to allow low-frequency audio signals to pass, but attenuates signals with frequencies higher than the cutoff frequency. These filters are design in a Pi network configuration. Radio communications are widely used in law enforcement and first responder vehicles to communicate among themselves and to the police stations or hospitals. These radios in Police Cars, Police Motorcycles, Ambulances, Fire Trucks, Rescue Vehicles and other First Responder vehicles are all connected to the vehicle’s battery. Other devices in the vehicles such as turn signaling lights, head lamps, search lights, AM/FM Radios, DVD players, on board computers and other electronics are also connected to the same vehicle battery. The noises emitted by these devices will interfere with the Radio transmissions over the air. By installing the EMI-Pxx series between the Radio equipment and the battery, noises from other devices are prevented from interfering with the Radio communications. 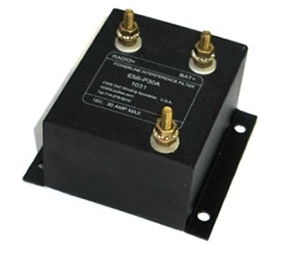 The EMI-Pxx series have mounting holes for direct mount to the vehicle chassis. The Positive Terminal of the battery is connected to the +Batt of the EMI-Pxx filter, and the Radio’s positive terminal is connected to the Radio terminal of the filter. In this way, the battery power for the Radio is isolated from other potentially noisy devices. EMI-P30A is rated for 30 amps of continuous operation. The EMI-P30A has been in field use by law enforcement and first responder vehicles for many years and many thousands have been shipped around the world. 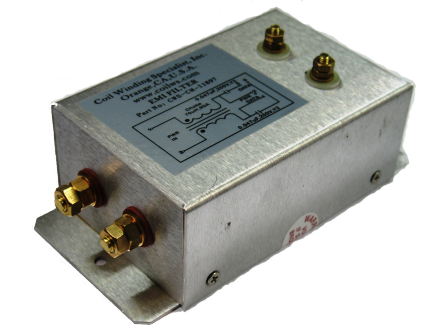 Following a request from Motorola Radio Division on a requirement for a 50 amps device for its Radios, CWS has released the 50 amps, EMI-P50A filter. As radios gets more and more sophisticated and more powerful, it also consumes more current. The EMI-P50A is rated at 50 amps of continuous operation. This higher current filter is currently in full production. Both the EMI-P30A and EMI-P50A are readily available from CWS and can be shipped immediately from stock. To order the parts, please click "Add to Cart" button in the table below. - Reduce Audible Noise Interference from Vehicle Batteries in Radio,CB,HF,VHF and UHF Communications. - Direct Mounting onto Police Cars and Motorcycles, Ambulances, Fire and Rescue Trucks, Trailer Trucks, etc.